For other uses, see Tetragrammaton (disambiguation). "YHWH" redirects here. For the historic Iron Age deity, see Yahweh. For the modern Jewish conception of God, see God in Judaism and God in Abrahamic religions. The tetragrammaton (/ˌtɛtrəˈɡræmətɒn/; from Greek Τετραγράμματον, meaning "[consisting of] four letters"), יהוה in Hebrew and YHWH in Latin script, is the four-letter biblical name of the God of Israel. The books of the Torah and the rest of the Hebrew Bible (with the exception of Esther and Song of Songs) contain this Hebrew name. Religiously observant Jews and those who follow Talmudic Jewish traditions do not pronounce יהוה, nor do they read aloud transliterated forms such as Yahweh; instead the word is substituted with a different term, whether used to address or to refer to the God of Israel. Common substitutions for Hebrew forms are hakadosh baruch hu ("The Holy One, Blessed Be He"), Adonai ("My Lord") or HaShem ("The Name"). The pronunciation as it is vowel pointed in the Masoretic Text. The vast majority of scholars do not hold the pronunciation to be correct. The letters YHWH are consonants. In unpointed Biblical Hebrew, most vowels are not written and the rest are written only ambiguously, as certain consonants can double as vowel markers (similar to the Latin use of V to indicate both U and V). These are referred to as matres lectionis ("mothers of reading"). Therefore, in general, it is difficult to deduce how a word is pronounced only from its spelling, and the tetragrammaton is a particular example: two of its letters can serve as vowels, and two are vocalic place-holders, which are not pronounced. The original consonantal text of the Hebrew Bible was, several centuries later, provided with vowel marks by the Masoretes to assist reading. In places that the consonants of the text to be read (the qere) differed from the consonants of the written text (the ketiv), they wrote the qere in the margin as a note showing what was to be read. In such a case the vowels of the qere were written on the ketiv. For a few frequent words, the marginal note was omitted: these are called qere perpetuum. One of the frequent cases was the tetragrammaton, which according to later Jewish practices should not be pronounced but read as "Adonai" ("My Lord"), or, if the previous or next word already was Adonai, as "Elohim" ("God"). The combination produces יְהֹוָה‎ and יֱהֹוה‎ respectively, non-words that would spell "Yehovah" and "Yehovih" respectively. The oldest complete or nearly complete manuscripts of the Masoretic Text with Tiberian vocalisation, such as the Aleppo Codex and the Leningrad Codex, both of the 10th or 11th century, mostly write יְהוָה (yhwah), with no pointing on the first h. It could be because the o diacritic point plays no useful role in distinguishing between Adonai and Elohim and so is redundant, or it could point to the qere being Shema, which is Aramaic for "the Name". The Hebrew scholar Wilhelm Gesenius [1786–1842] suggested that the Hebrew punctuation יַהְוֶה‎, which is transliterated into English as Yahweh, might more accurately represent the pronunciation of the tetragrammaton than the Masoretic punctuation "יְהֹוָה‎", from which the English name Jehovah has been derived. His proposal to read YHWH as "יַהְוֶה" (see image to the left) was based in large part on various Greek transcriptions, such as ιαβε, dating from the first centuries CE but also on the forms of theophoric names. In his Hebrew Dictionary, Gesenius supports Yahweh (which would have been pronounced [jahwe], with the final letter being silent) because of the Samaritan pronunciation Ιαβε reported by Theodoret, and because the theophoric name prefixes YHW [jeho] and YW [jo], the theophoric name suffixes YHW [jahu] and YH [jah], and the abbreviated form YH [jah] can be derived from the form Yahweh. Gesenius's proposal to read YHWH as יַהְוֶה is accepted as the best scholarly reconstructed vocalised Hebrew spelling of the tetragrammaton. 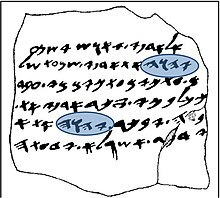 An image on the piece of pottery found at Kuntillet Ajrud is adjacent to a Hebrew inscription "Berakhti etkhem l’YHVH Shomron ul’Asherato" ("I have blessed you by Yahweh of Samaria and [his] Asherah") dated around 800 BCE, on the walls of the second tomb on the southern slope of the Khirbet el-Qom hill (VIII century BCE), on the seal from the collections of the Harvard Semitic Museum (VIII century BCE), on ostracons from the collections of Shlomo Moussaieff (VII BCE), on silver rolls from Ketef Hinnom (VII century BCE), on inscriptions in the tombs of Khirbet Beit Lei (VIII - VII century BCE), on ostracons from Tel Arad (2nd half of the seventh and the beginning of the 6th century BCE), on the Lachish letters (587 BCE) and on a stone from Mount Gerizim (III or at the beginning of the second century BCE). The Elephantine papyri, on which the jhw form appears, with the form of jhh are found on Elephantine. One time jh also appears, but originally it was a form of jhw in which the final letter in (Hebrew waw) disappeared. In eight cases, the tetragram occurs in the formula of the oath: "God's jhh". God's name appears in the Greek magical texts, the formation of which was established between the second century BCE to CE. It takes the following forms: Ieoa, Iaoa, Iaoai, Iaoouee, Ioa, Iao, Iaeo, Iaee, Ieou, Iaba, Iabas, Iabo, Iabe, Iaon. God's name in the form of Ἰαῶ (Iao) appears in: Diodorus Siculus, Marcus Terentius Varro according to the message of John the Lydian (De Mensibus, 4.53), Pedanius Dioscorides, Aelius Herodian, Hesychius of Alexandria. A form of the name appears on the following Egyptian inscriptions: on the list of Amenhotep III discovered in the Temple of Amon in Soleb and in its copy from the time of Ramesses II in West Amara (recorded: yhw3, read: ja-h-wi or ja-h-wa), and on the list of places in the temple of Ramesses III in Medinet Habu (as ji-ha or ja-h-wi). The oldest known inscription of the tetragrammaton dates to 840 BCE, on the Mesha Stele. It bears the earliest certain extra-biblical reference to the Israelite God Yahweh. The most recent discovery of a tetragrammaton inscription, dating to the 6th century BCE, was found written in Hebrew on two silver scrolls recovered from Jerusalem. The spellings of the tetragrammaton occur among the many combinations and permutations of names of powerful agents that occur in Jewish magical papyri found in Egypt. One of these forms is the heptagram ιαωουηε. In the Jewish magical papyri, Iave and Iαβα Yaba occurs frequently. Among the Jews in the Second Temple Period magical amulets became very popular. The tetragram appeared on them, in the form of J, JJ, JJJ, JJJJ or JH, JHW, as the word 'HJH', and in a long series of permutations: ', H, W and J.
Yawe is found in an Ethiopian Christian list of magical names of Jesus, purporting to have been taught by him to his disciples. In the Hebrew Bible, the tetragrammaton occurs 6828 times,:142 as can be seen in the Biblia Hebraica and Biblia Hebraica Stuttgartensia. In addition, on the margins there are notes (masorah[note 1]) indicating that in 134 places the soferim (Jewish scribes) altered the original Hebrew text from YHWH to Adonai[note 2] and 8 places to Elohim, which would add 142 occurrences to the initial number above. According to Brown–Driver–Briggs, יְהֹוָה‎ (Qr אֲדֹנָי‎) occurs 6,518 times, and יֱהֹוִה‎ (Qr אֱלֹהִים‎) occurs 305 times in the Masoretic Text. It first appears in Hebrew in the Book of Genesis 2:4. The only books it does not appear in are Ecclesiastes, the Book of Esther, and Song of Songs. In the Book of Esther the Tetragrammaton does not appear, but it is present in four complex acrostics in Hebrew: the initial or last letters of four consecutive words, either forwards or backwards comprise YHWH. These letters were distinguished in at least three ancient Hebrew manuscripts in red. [note 3] Another acrostic containing the Tetragrammaton also composed the first four words of Psalm 96:11. Short form Jah (digrammaton) "occurs 50 times if the phrase hallellu-Yah is included": 43 times in the Psalms, one in Exodus 15:2; 17:16; Isaiah 12:2; 26:4, and twice in Isaiah 38:11. It also appears in the Greek phrase Ἁλληλουϊά (hallelujah) in Revelation 19:1–6. God's name is also found in the Bible as a component in theophoric Hebrew names. Some may have had at the beginning of the form: jô- or jehô- (29 names), and the other at the end: jāhû- or jāh- (127 names). One name is a form of jehô as the second syllable (Elioenaj, hebr. ʼelj(eh)oʻenaj). Onomastic Studies indicate that theophoric names containing the Tetragrammaton were very popular during the monarchy (8th–7th centuries BCE). [note 4] The popular names with the prefix jô-/jehô- diminished, while the suffix jāhû-/jāh- increased. The Septuagint typically translates YHWH as kyrios "Lord". Below are the number of occurrences of the Tetragrammaton in various books in the Masoretic Text (6828 in all). Six Hebrew spellings of the tetragrammaton are found in the Leningrad Codex of 1008–1010, as shown below. The entries in the Close Transcription column are not intended to indicate how the name was intended to be pronounced by the Masoretes, but only how the word would be pronounced if read without qere perpetuum. Genesis 2:4 יְהוָה‎ Yǝhwāh  This is the first occurrence of the tetragrammaton in the Hebrew Bible and shows the most common set of vowels used in the Masoretic text. It is the same as the form used in Genesis 3:14 below, but with the dot (holam) on the first he left out, because it is a little redundant. Genesis 3:14 יְהֹוָה‎ Yǝhōwāh  This is a set of vowels used rarely in the Masoretic text, and are essentially the vowels from Adonai (with the hataf patakh reverting to its natural state as a shewa). Judges 16:28 יֱהֹוִה‎ Yĕhōwih  When the tetragrammaton is preceded by Adonai, it receives the vowels from the name Elohim instead. The hataf segol does not revert to a shewa because doing so could lead to confusion with the vowels in Adonai. Genesis 15:2 יֱהוִה‎ Yĕhwih  Just as above, this uses the vowels from Elohim, but like the second version, the dot (holam) on the first he is omitted as redundant. 1 Kings 2:26 יְהֹוִה‎ Yǝhōwih  Here, the dot (holam) on the first he is present, but the hataf segol does get reverted to a shewa. Ezekiel 24:24 יְהוִה‎ Yǝhwih  Here, the dot (holam) on the first he is omitted, and the hataf segol gets reverted to a shewa. ĕ is hataf segol; ǝ is the pronounced form of plain shva. The o diacritic dot (holam) on the first he is often omitted because it plays no useful role in distinguishing between the two intended pronunciations Adonai and Elohim (which both happen to have an o vowel in the same position). In the Dead Sea Scrolls and other Hebrew and Aramaic texts the tetragrammaton and some other names of God in Judaism (such as El or Elohim) were sometimes written in paleo-Hebrew script, showing that they were treated specially. Most of God's names were pronounced until about the 2nd century BCE. Then, as a tradition of non-pronunciation of the names developed, alternatives for the tetragrammaton appeared, such as Adonai, Kurios and Theos. The 4Q120, a Greek fragment of Leviticus (26:2–16) discovered in the Dead Sea scrolls (Qumran) has ιαω ("Iao"), the Greek form of the Hebrew trigrammaton YHW. The historian John the Lydian (6th century) wrote: "The Roman Varo [116–27 BCE] defining him [that is the Jewish God] says that he is called Iao in the Chaldean mysteries" (De Mensibus IV 53). Van Cooten mentions that Iao is one of the "specifically Jewish designations for God" and "the Aramaic papyri from the Jews at Elephantine show that 'Iao' is an original Jewish term". The preserved manuscripts from Qumran show the inconsistent practice of writing the tetragrammaton, mainly in biblical quotations: in some manuscripts is written in paleo-Hebrew script, square scripts or replaced with four dots or dashes (tetrapuncta). The members of the Qumran community were aware of the existence of the tetragrammaton, but this was not tantamount to granting consent for its existing use and speaking. This is evidenced not only by special treatment of the tetragrammaton in the text, but by the recommendation recorded in the 'Rule of Association' (VI, 27): "Who will remember the most glorious name, which is above all [...]". The table below presents all the manuscripts in which the tetragrammaton is written in paleo-Hebrew script,[note 5] in square scripts, and all the manuscripts in which the copyists have used tetrapuncta. Copyists used the 'tetrapuncta' apparently to warn against pronouncing the name of God. In the manuscript number 4Q248 is in the form of bars. The date of composition is an estimate according to Peter Muchowski, as found in "Commentaries to the Manuscripts of the Dead Sea" by Emanuel Tov in "Scribal Practices and Approaches, Reflected in the Texts Found in the Judean Desert". The numbers on the horizontal line are the approximate year the manuscripts was produced. The most complete copies of the Septuagint (B, א, A), versions from fourth century onwards consistently use Κύριος ("Lord"), or Θεός ("God"), where the Hebrew has YHWH, corresponding to substituting Adonai for YHWH in reading the original, but the oldest fragments have the tetragrammaton in Hebrew or Paleo-Hebrew characters, with the exception of P. Ryl. 458 (perhaps the oldest extant Septuagint manuscript) where there are blank spaces, leading some scholars such as Colin Henderson Roberts to believe that it contained letters, and 4Q120 that has ΙΑΩ. According to Paul E. Kahle, in P. Ryl. 458 the tetragrammaton must have been written where these breaks or blank spaces appear. Albert Pietersma claims that P. Ryl. 458 is irrelevant in this discussion: Kahle insisted that a lacuna in it too large for the usual abbreviation κς, which C.H. Roberts suggested was intended for the complete word κύριος, was instead meant for the Hebrew tetragrammaton; Pietersma holds that "the full κύριος would seem to be perfectly acceptable from every perspective". The oldest known LXX manuscript that has the Hebrew tetragrammaton is of the first century BCE, with the letters written in square script. A slightly later one (between 50 BCE and 50 CE) has the tetragrammon in archaic Paleo-Hebrew letters. Of the same period as the oldest LXX manuscript with the Hebrew tetragrammaton is the manuscript 4Q120 with the Greek trigrammaton ΙΑΩ. P.W. Skehan and Martin Hengel propose that the Septuagint originally had ΙΑΩ (pronounced Yaho = Aramaic יהו) and that this was altered to Aramaic/Hebrew characters and later to Paleo-Hebrew and finally was replaced by Κύριος. In the more accurate exemplars [of the LXX] the (divine) name is written in Hebrew characters; not, however, in the current script, but in the most ancient. Other old fragments cannot be used in this discussion because, in addition to their brevity and fragmentary condition, they include no Hebrew Bible verse containing the Tetragrammaton (i.e. 4Q119, 4Q121, 4Q122, 7Q5). 4Q126, which contains the word κύριος cannot be cited as using it for the tetragrammaton, since its unidentified text is not necessarily biblical. In Septuagint manuscripts dating from about the third century CE onwards (e.g., P.Oxy656, P.Oxy1075 and P.Oxy1166) the Greek word Κύριος (Lord) is used rather frequently to represent the divine name יהוה (YHWH) and can be what was used when reading out representations in non-Greek characters. The original Greek translation of the divine name has proved to be a heavily debated subject. A constantly great amount of scholarly effort has been put in this question, especially as a result of more recent discoveries that challenged previously long-held assumptions. More specifically, W. G. von Baudissin (1929) maintained that right from its origins the LXX had rendered the Tetragrammaton by κύριος, and that in no case was this latter a mere substitute for an earlier αδωναι. Based on more recent evidence that had became available, P. Kahle (1960) supported that the Tetragrammaton written with Hebrew or Greek letters was retained in the OG and it was the Christians who later replaced it with κύριος. S. Jellicoe (1968) concurred with Kahle. H. Stegemann (1969/1978) argued that Ιαω /i.a.o/ was used in the original LXX. G. Howard (1977/1992) suggested that κύριος was not used in the pre-Christian OG. P. W. Skehan (1980) proposed that there had been a textual development concerning the divine name in this order: Ιαω, the Tetragrammaton in square Hebrew characters, the Tetragrammaton in paleo-Hebrew characters and, finally, κύριος. M. Hengel (1989) offered a similar scheme for the use of κύριος for the divine name in the LXX tradition. Evolving R. Hanhart’s position (1978/1986/1999), A. Pietersma (1984) regarded κύριος as the original Greek rendering of the Tetragrammaton in the OG text. This view was supported later by J. W. Wevers (2005) and M. Rösel (2007). Moreover, Rösel argued against the Ιαω being the original LXX rendering of the Tetragrammaton. E. Tov (1998/2004/2008), J. Joosten (2011), and A. Meyer (2014) concluded that Pietersma’s arguments are unconvincing. More particularly, Tov has supported that the original translators used a pronounceable form of the Hebrew Tetragrammaton (like Ιαω), which was later replaced by κύριος, while Greek recensions replaced it with transliterations in paleo-Hebrew or square Hebrew characters. R. Furuli (2011), after comparing the various proposals, argued that κύριος did not replace the Tetragrammaton before the Common Era and the LXX autographs included the Tetragrammaton in some form of Ιαω. Truly, the hard evidence available supports this latter thesis. Throughout the Septuagint, as now known, the word Κύριος (Kyrios) without the definite article is used to represent the divine name, but it is uncertain whether this was the Septuagint's original rendering. Origen (Commentary on Psalms 2.2) and Jerome (Prologus Galeatus) said that in their time the best manuscripts gave not the word Κύριος but the tetragrammaton itself written in an older form of the Hebrew characters. No Jewish manuscript of the Septuagint has been found with Κύριος representing the tetragrammaton, and it has been argued, but not widely accepted, that the use of Κύριος shows that later copies of the Septuagint were of Christian character, and even that the composition of the New Testament preceded the change to Κύριος in the Septuagint. Its consistent use of Κύριος to represent the tetragrammaton has been called "a distinguishing mark for any Christian LXX manuscript", However, a passage in the Hebrew Tosefta, Shabbat 13:5 (written c. 300 CE), quoting Tarfon (who lived between 70 and 135 CE), says that it was permitted on the Sabbath to burn Christian works − gilyonim (gospels?) and other writings − even if they contained the names of God written in them (without specifying the form or forms in which the names of God were written − as the Aramaic or Paleo-Hebrew Tetragrammaton, as ΙΑΩ or otherwise). In the same year as the summary by Vasileiadis of older interpretations (2014), Frank Shaw published his The Earliest Non-Mystical Jewish Use of Ιαω, in which he argues that the divine name was still articulated until the second or third century and that the use of Ιαω was by no means limited to magical or mystical formulas, but was still normal in more elevated contexts such as that exemplified by Papyrus 4Q120. Shaw describes as "inconsistent and contradictory" the arguments by Pietersma, Rösel and Perkins for the originality of κύριος and considers all theories that posit in the Septuagint a single original form of the divine name as merely based on a priori assumptions. Accordingly, he declares: "The matter of any (especially single) 'original' form of the divine name in the LXX is too complex, the evidence is too scattered and indefinite, and the various approaches offered for the issue are too simplistic" to account for the actual scribal practices (p. 158). He holds that the earliest stages of the LXX's translation were marked by diversity (p. 262), with the choice of certain divine names depending on the context in which they appear (cf. Gen 4:26; Exod 3:15; 8:22; 28:32; 32:5; and 33:19). He treats of the related blank spaces in Septuagint manuscripts and the setting of spaces around the divine name in 4Q120 and another manuscript (p. 265), and repeats that "there was no one 'original' form but different translators had different feelings, theological beliefs, motivations, and practices when it came to their handling of the name" (p. 271). His view on these points has won the support of Didier Fontaine, Anthony R. Meyer, Bob Becking, and earlier (commenting on Shaw's 2011 dissertation on the subject) D.T. Runia. In the list of 120 or so manuscripts and fragments of Old Greek translations (LXX, Aquila etc.) down to and including the complete texts, Robert A. Kraft indicates that one has spaces in place of the Tetragrammaton (P. Ryl. 458) and one has ΙΑΩ (4Q120) in the period before the turn of the era. Extant manuscripts containing κύριος, including the Vaticanus and Sinaiticus codices, are from the third century CE onwards. Papyrus Rylands 458 – contains fragments of Deuteronomy. Has blank spaces where the copyist probably had to write either the tetragrammaton or the word κύριος. It has been dated to 2nd century BCE. 4QpapLXXLevb – contains fragments of the Book of Leviticus, chapters 1 to 5. In two verses: 3:12; 4:27 the tetragrammaton of the Hebrew Bible is represented by the Greek trigrammaton ΙΑΩ. This manuscript is dated to the 1st century BCE. Papyrus Fouad 266b (848) – contains fragments of Deuteronomy, chapters 10 to 33, dated to 1st century BCE. The tetragrammaton appears in square Hebrew/Aramaic script. According to a disputed view, the first copyist left a blank space marked with a dot, and another inscribed the letters. Papyrus Oxyrhynchus 3522 – contains parts of two verses of chapter 42 of the Book of Job and has the tetragrammaton written in paleo-Hebrew letters. It has been dated to the 1st century BCE. 8HevXII gr – dated to the 1st century CE, includes three fragments published separately. 8HevXII a (LXXVTS 10a) in 24 places, whole or in part. 8HevXII b (LXXVTS 10b) in 4 places. Papyrus Oxyrhynchus 1007 – this manuscript in vitela form contains Genesis 2 and 3. The divine name is written with a double yodh. It has been assigned paleographically to the 3rd century. Papyrus Oxyrhynchus 656 – containing fragments of the Book of Genesis, chapters 14 to 27. The first copyist left blank spaces in which a second wrote Kyrios. It is dated to the late 2nd or early 3rd century CE. Papyrus Berlin 17213 – containing fragments of the Book of Genesis, chapter 19. Contains one blank space that may have been for the name of God, but Emanuel Tov thinks that it was to mark the end of a paragraph. It has been dated to 3rd century CE. Taylor-Schechter 16.320 – tetragrammaton in Hebrew, 550 – 649 CE. Codex Marchalianus – uses ΙΑΩ as the divine name, but in the margin represents the tetragrammaton by the Greek letters ΠΙΠΙ. It is a 6th-century Greek manuscript. Papyrus Vindobonensis Greek 39777, the P.Vindob.G.39777 – dated to late 3rd century or beginning 4th century. AqTaylor, this manuscript of the Aquila version is dated after the middle of the 5th century, but not later than the beginning of the 6th century. AqBurkitt – a palimpsest manuscript of the Aquila version dated late 5th century or early 6th century. In the Hexapla, the tetragrammaton is included in works by Aquila, Symmachus and Theodotion, but additionally in three other anonymous Greek translations (Quinta, Sextus and Septima). Taylor-Schechter 12.182 – a Hexapla manuscript with tetragrammaton in Greek letters ΠΙΠΙ. It is from 7th-century. Ambrosiano O 39 sup. – the latest Greek manuscript containing the name of God is Origen's Hexapla, transmitting among other translations the text of the Septuagint. This codex comes from the late 9th century, and is stored in the Biblioteca Ambrosiana. Sidney Jellicoe concluded that "Kahle is right in holding that LXX [Septuagint] texts, written by Jews for Jews, retained the divine name in Hebrew Letters (paleo-Hebrew or Aramaic) or in the Greek-letters imitative form ΠΙΠΙ, and that its replacement by Κύριος was a Christian innovation". Jellicoe draws together evidence from a great many scholars (B. J. Roberts, Baudissin, Kahle and C. H. Roberts) and various segments of the Septuagint to draw the conclusions that the absence of "Adonai" from the text suggests that the insertion of the term Kyrios was a later practice; in the Septuagint Kyrios is used to substitute YHWH; and the tetragrammaton appeared in the original text, but Christian copyists removed it. Eusebius and Jerome (translator of the Vulgate) used the Hexapla. Both attest to the importance of the sacred Name and that some manuscripts of Septuagint contained the tetragrammaton in Hebrew letters. This is further affirmed by The New International Dictionary of New Testament Theology, which states "Recently discovered texts doubt the idea that the translators of the LXX (Septuagint) have rendered the tetragrammaton JHWH with KYRIOS. The most ancient available manuscripts of the LXX have the tetragrammaton written in Hebrew letters in the Greek text. This was a custom preserved by the later Hebrew translator of the Old Testament in the first centuries (after Christ)"
David Trobisch has noted that, while Christian manuscripts of the Jewish Bible use Kύριος or the nomina sacra Θς and κς (with a horizontal line above the contracted words) to represent the Tetragrammaton, manuscripts of Greek translations of the Old Testament written by Jewish scribes, such as those found in Qumran, reproduce it within the Greek text in several different ways. Some give it in either Hebrew, Aramaic or paleo-Hebrew letters. Others transliterate it in Greek characters as ΠΙΠΙ or ΙΑΩ. The fragment Papyrus Oxyrhynchus 1007 is in fact difficult to identify as either Christian or Jewish, as on the barely legible recto side (in Gen 2:18) it contains the nomen sacrum ΘΣ (characteristic of Christian manuscripts) and the Tetragrammaton represented as a double yodh יי (characteristic of Jewish manuscripts). According to Edmon Gallagher, a faculty member of Heritage Christian University, "extant Greek manuscripts from Qumran and elsewhere that are unambiguously Jewish (because of the date) also include several ways of representing the Divine Name, none of which was with κύριος, the term used everywhere in our Christian manuscripts". He concludes that there is no certainty about whether it was a Jew or a Christian who transcribed the Cairo Genizah manuscripts of the Greek translation of the Hebrew Bible by Aquila (not the LXX), in which the Tetragrammaton is generally given in paleo-Hebrew letters but in one instance, where there was insufficient space at the end of a line, by κυ, the nomen sacrum rendering of the genitive case of Κύριος. E. Gallagher also "has argued convincingly that Christian scribes might have produced paleo-Hebrew Tetragrammata within their biblical manuscripts, in addition to the attested use of the forms יהוה and πιπι." In books written in Greek (e.g., Wisdom, 2 and 3 Maccabees), Κύριος takes the place of the name of God. 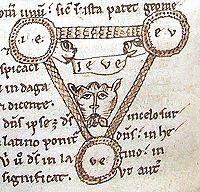 Petrus Alphonsi's early 12th-century Tetragrammaton-Trinity diagram, rendering the name as "IEVE"
Epiphanius (died 404), who was born in Palestine and spent a considerable part of his life there, gives Ἰά (Ia) and Ἰάβε (pronounced at that time /ja'vε/) and explains Ἰάβε as meaning He who was and is and always exists. Jerome (died 420) speaks of certain Greek writers who misunderstood the Hebrew letters יהוה‎ (read right-to-left) as the Greek letters ΠΙΠΙ (read left-to-right), thus changing YHWH to pipi. The Peshitta (Syriac translation), probably in the second century, uses the word "Lord" (ܡܳܪܝܳܐ, pronounced moryo) for the Tetragrammaton. The Vulgate (Latin translation) made from the Hebrew in the 4th century CE, uses the word Dominus ("Lord"), a translation of the Hebrew word Adonai, for the tetragrammaton. The Vulgate translation, though made not from the Septuagint but from the Hebrew text, did not depart from the practice used in the Septuagint. Thus, for most of its history, Christianity's translations of the Scriptures have used equivalents of Adonai to represent the tetragrammaton. Only at about the beginning of the 16th century did Christian translations of the Bible appear with transliterations of the tetragrammaton. Some time after the destruction of Solomon's Temple, the spoken use of God's name as it was written ceased among the people, even though knowledge of the pronunciation was perpetuated in rabbinic schools. The Talmud relays this occurred after the death of Simeon the Just (either Simon I or his great-great-grandson Simon II). Philo calls it ineffable, and says that it is lawful for those only whose ears and tongues are purified by wisdom to hear and utter it in a holy place (that is, for priests in the Temple). In another passage, commenting on Lev. xxiv. 15 seq. : "If any one, I do not say should blaspheme against the Lord of men and gods, but should even dare to utter his name unseasonably, let him expect the penalty of death." Rabbinic sources suggest that the name of God was pronounced only once a year, by the high priest, on the Day of Atonement. Others, including Maimonides, claim that the name was pronounced daily in the liturgy of the Temple in the priestly benediction of worshippers (Num. vi. 27), after the daily sacrifice; in the synagogues, though, a substitute (probably "Adonai") was used. According to the Talmud, in the last generations before the fall of Jerusalem, the name was pronounced in a low tone so that the sounds were lost in the chant of the priests. Since the destruction of Second Temple of Jerusalem in 70 CE, the tetragrammaton has no longer been pronounced in the liturgy. However the pronunciation was still known in Babylonia in the latter part of the 4th century. The vehemence with which the utterance of the name is denounced in the Mishnah suggests that use of Yahweh was unacceptable in rabbinical Judaism. "He who pronounces the Name with its own letters has no part in the world to come!" Such is the prohibition of pronouncing the Name as written that it is sometimes called the "Ineffable", "Unutterable", or "Distinctive Name". Halakha prescribes that whereas the Name written "yodh he waw he", it is only to be pronounced "Adonai"; and the latter name too is regarded as a holy name, and is only to be pronounced in prayer. Thus when someone wants to refer in third person to either the written or spoken Name, the term HaShem "the Name" is used; and this handle itself can also be used in prayer. The Masoretes added vowel points (niqqud) and cantillation marks to the manuscripts to indicate vowel usage and for use in ritual chanting of readings from the Bible in Jewish prayer in synagogues. To יהוה‎ they added the vowels for "Adonai" ("My Lord"), the word to use when the text was read. While "HaShem" is the most common way to reference "the Name", the terms "HaMaqom" (lit. "The Place", i.e. "The Omnipresent") and "Raḥmana" (Aramaic, "Merciful") are used in the mishna and gemara, still used in the phrases "HaMaqom y'naḥem ethḥem" ("may The Omnipresent console you"), the traditional phrase used in sitting Shiva and "Raḥmana l'tzlan" ("may the Merciful save us" i.e. "God forbid"). The written tetragrammaton, as well as six other names of God, must be treated with special sanctity. They cannot be disposed of regularly, lest they be desecrated, but are usually put in long term storage or buried in Jewish cemeteries in order to retire them from use. Similarly, writing the tetragrammaton (or these other names) unnecessarily is prohibited, so as to avoid having them treated disrespectfully, an action that is forbidden. To guard the sanctity of the Name, sometimes a letter is substituted by a different letter in writing (e.g. יקוק), or the letters are separated by one or more hyphens, a practice applied also to the English name "God", which Jews commonly write as "G-d". Most Jewish authorities say that this practice is not obligatory for the English name. Kabbalistic tradition holds that the correct pronunciation is known to a select few people in each generation, it is not generally known what this pronunciation is. In late kabbalistic works the tetragrammaton is sometimes referred to as the name of Havayah—הוי'ה, meaning "the Name of Being/Existence". This name also helps when one needs to refer specifically to the written Name; similarly, "Shem Adonoot", meaning "the Name of Lordship" can be used to refer to the spoken name "Adonai" specifically. 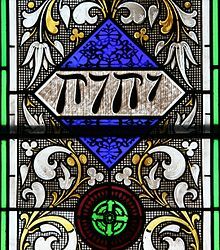 ע"ב/`AV : יו"ד ה"י וי"ו ה"י, so called "`AV" according to its gematria value ע"ב=70+2=72. ס"ג/SaG: יו"ד ה"י וא"ו ה"י, gematria 63. מ"ה/MaH: יו"ד ה"א וא"ו ה"א, gematria 45. ב"ן/BaN: יו"ד ה"ה ו"ו ה"ה, gematria 52. Luzzatto summarises, "In sum, all that exists is founded on the mystery of this Name and upon the mystery of these letters of which it consists. This means that all the different orders and laws are all drawn after and come under the order of these four letters. This is not one particular pathway but rather the general path, which includes everything that exists in the Sefirot in all their details and which brings everything under its order." Another parallel is drawn[by whom?] between the four letters of the tetragrammaton and the Four Worlds: the י is associated with Atziluth, the first ה with Beri'ah, the ו with Yetzirah, and final ה with Assiah. consequently the three-dimensional solid naturally falls to Chesed." The relationship between geometrical shapes and the first four Sephirot is analogous to the geometrical correlations in tetractys, shown above under Pythagorean Symbol, and unveils the relevance of the Tree of Life with the tetractys. The Samaritans shared the taboo of the Jews about the utterance of the name, and there is no evidence that its pronunciation was common Samaritan practice. However Sanhedrin 10:1 includes the comment of Rabbi Mana II, "for example those Kutim who take an oath" would also have no share in the world to come, which suggests that Mana thought some Samaritans used the name in making oaths. (Their priests have preserved a liturgical pronunciation "Yahwe" or "Yahwa" to the present day.) As with Jews, the use of Shema (שמא "the Name") remains the everyday usage of the name among Samaritans, akin to Hebrew "the Name" (Hebrew השם "HaShem"). It is assumed that early Jewish Christians inherited from Jews the practice of reading "Lord" where the tetragrammaton appeared in the Hebrew text, or where a tetragrammaton may have been marked in a Greek text. Gentile Christians, primarily non-Hebrew speaking and using Greek texts, may have read "Lord" as it occurred in the Greek text of the New Testament and their copies of the Greek Old Testament. This practice continued into the Latin Vulgate where "Lord" represented the tetragrammaton in the Latin text. In Petrus Alphonsi's Tetragrammaton-Trinity diagram, the name is written as "Ieve". At the Reformation, the Luther Bible used "Jehova" in the German text of Luther's Old Testament. As mentioned above, the Septuagint (Greek translation), the Vulgate (Latin translation), and the Peshitta (Syriac translation) use the word "Lord" (κύριος, kyrios, dominus, and ܡܳܪܝܳܐ, moryo respectively). Use of the Septuagint by Christians in polemics with Jews led to its abandonment by the latter, making it a specifically Christian text. From it Christians made translations into Coptic, Arabic, Slavonic and other languages used in Oriental Orthodoxy and the Eastern Orthodox Church, whose liturgies and doctrinal declarations are largely a cento of texts from the Septuagint, which they consider to be inspired at least as much as the Masoretic Text. Within the Eastern Orthodox Church, the Greek text remains the norm for texts in all languages, with particular reference to the wording used in prayers. The Septuagint, with its use of Κύριος to represent the tetragrammaton, was the basis also for Christian translations associated with the West, in particular the Vetus Itala, which survives in some parts of the liturgy of the Latin Church, and the Gothic Bible. Christian translations of the Bible into English commonly use "LORD" in place of the tetragrammaton in most passages, often in small capitals (or in all caps), so as to distinguish it from other words translated as "Lord". The Bible In Basic English (1949/1964) uses "Yahweh" eight times, including Exodus 6:2–3. The Jerusalem Bible (1966) uses "Yahweh" in 6,823 places in the Old Testament. The New English Bible (NT 1961, OT 1970) generally uses the word "LORD" but uses "JEHOVAH" several times. For examples of both forms, see Exodus Chapter 3 and footnote to verse 15. The New International Version (1973/1978/1983/2011) generally uses "the LORD," though in Exodus 3:14, the tetragrammaton is thrice translated "I AM." In the Old Testament, when immediately preceded by אֲדֹנָי (Adonai), the two words are translated "the Sovereign LORD." The New Jerusalem Bible (1985) uses "Yahweh" in 6,823 places in the Old Testament. The Amplified Bible (1954/1987). At Exodus 6:3 the AB says "but by My name the Lord [Yahweh—the redemptive name of God] I did not make Myself known to them." The Living Bible (1971). "Jehovah" or "Lord". The Holman Christian Standard Bible (1999/2002) uses "Yahweh" over 50 times, including Exodus 6:2. The World English Bible (WEB) (1997) [a Public Domain work with no copyright] uses "Yahweh" some 6837 times. The New Living Translation (1996/2004) uses "Yahweh" ten times, including Exodus 6:2–3. The Preface of the New Living Translation: Second Edition says that in a few cases they have used the name Yahweh (for example 3:15; 6:2–3). The Anchor Bible (in progress) retains "Yahweh" throughout the Old Testament. The King James Version (1611) – Jehovah appears seven times, i.e. four times as "JEHOVAH", Exodus 6:3; Psalm 83:18; Isaiah 12:2; 26:4, and three times as a part of Hebrew place-names Genesis 22:14; Exodus 17:15; Judges 6:24. Note: Elsewhere in the KJV, "LORD" is generally used. But in verses such as Genesis 15:2; 28:13; Psalm 71:5; Amos 1:8; 9:5, where this practice would result in "Lord LORD" (Hebrew: Adonay JHVH) or "LORD Lord" (JHVH Adonay) the KJV translates the Hebrew text as 'Lord GOD' or "LORD God". In the New Testament, when quoting Psalm 110:1, the all-caps LORD for the Tetragrammaton appears four times, where the ordinary word "Lord" also appears: Matthew 22:44, Mark 12:36, Luke 20:42 and Acts 2:34. The American Standard Version (1901) uses "Jehovah" in 6,823 places in the Old Testament. The Lexham English Bible (2012) uses "Yahweh" throughout the Old Testament. Green's Literal Translation (1985) uses "Jehovah" in 6,866 places in the Old Testament. The Recovery Version (1999) uses "Jehovah" in 6,841 places in the Old Testament. The Bible in Living English (1972) by Steven T. Byington, published by the Watchtower Bible and Tract Society, renders the Tetragrammaton as "Jehovah" throughout the Old Testament over 6,800 times. The Names of God Bible (2011,2014) by Ann Spangler uses "Yahweh" throughout the Old Testament. The New World Translation (1961/1984/2013), published by the Watchtower Bible and Tract Society, uses "Jehovah" in 7,216 places in both the Old Testament and New Testament; 6,979 times in the Old Testament and 237 in the New Testament—including 70 of the 78 times where the New Testament quotes an Old Testament passage containing the Tetragrammaton, where the Tetragrammaton does not appear in any extant Greek manuscript. the Sacred Scriptures Bethel Edition (1981) used by adherents of the Church of God (Seventh Day) inserts the name Yahweh in the Old and New Testament. The Divine Name King James Bible (2011) uses "Jehovah" in 6,973 places and "Jah" in 50 places in the Old Testament. In addition, Jehovah appears in parentheses in 128 places in the New Testament wherever the New Testament quotes an Old Testament verse as a gloss (cross reference), totalling to 7,151 places in all. In the second edition of the Nova Vulgata Bibliorum Sacrorum Editio, editio typica altera, published in 1986, these few occurrences of the form Iahveh were replaced with Dominus, in keeping with the long-standing Catholic tradition of avoiding direct usage of the Ineffable Name. On 29 June 2008, the Holy See reacted to the then still recent practice of pronouncing, within Catholic liturgy, the name of God represented by the tetragrammaton. As examples of such vocalisation it mentioned "Yahweh" and "Yehovah". The early Christians, it said, followed the example of the Septuagint in replacing the name of God with "the Lord", a practice with important theological implications for their use of "the Lord" in reference to Jesus, as in Philippians 2:9-11 and other New Testament texts. It therefore directed that, "in liturgical celebrations, in songs and prayers the name of God in the form of the tetragrammaton YHWH is neither to be used or pronounced"; and that translations of Biblical texts for liturgical use are to follow the practice of the Greek Septuagint and the Latin Vulgate, replacing the divine name with "the Lord" or, in some contexts, "God". The United States Conference of Catholic Bishops welcomed this instruction, adding that it "provides also an opportunity to offer catechesis for the faithful as an encouragement to show reverence for the Name of God in daily life, emphasizing the power of language as an act of devotion and worship". ^ masora parva (small) or masora marginalis are notes to the Masoretic text, written in the margins of the left, right and between the columns and the comments on the top and bottom margins to masora magna (large). ^ C. D. Ginsburg in The Massorah. Compiled from manuscripts, London 1880, vol I, p. 25, 26, § 115 lists the 134 places where this practice is observed. Comparing this list with text by BHS can be noted that BHS puts the Tetragrammaton in the main text only in Psalm 68:28 [68:27]. ^ These are Est 1:20; 5:4, 13 and 7:7. Additionally, Est 7:5 there is an acrostic referring to the title of God of Exodus 3:14. ^ In some manuscripts the tetragrammaton was replaced by the word ’El or ’Elohim written in Paleo-Hebrew script, they are: 1QpMic (1Q14) 12 3; 1QMyst (1Q27) II 11; 1QHa I (Suk. = Puech IX) 26; II (X) 34; VII (XV) 5; XV (VII) 25; 1QHb (1Q35) 1 5; 3QUnclassified fragments (3Q14) 18 2; 4QpPsb (4Q173) 5 4; 4QAges of Creation A (4Q180) 1 1; 4QMidrEschate? (4Q183) 2 1; 3 1; fr. 1 kol. II 3; 4QSd (4Q258) IX 8; 4QDb (4Q267) fr. 9 kol. i 2; kol. iv 4; kol. v 4; 4QDc (4Q268) 1 9; 4QComposition Concerning Divine Providence (4Q413) fr. 1–2 2, 4; 6QD (6Q15) 3 5; 6QpapHymn (6Q18) 6 5; 8 5; 10 3. W 4QShirShabbg (4Q406) 1 2; 3 2 występuje ’Elohim. ^ a b c d e Knight, Douglas A.; Levine, Amy-Jill (2011). The Meaning of the Bible: What the Jewish Scriptures and Christian Old Testament Can Teach Us (1st ed.). New York: HarperOne. ISBN 0062098594. ^ It originates from tetra "four" + γράμμα gramma (gen. grammatos) "letter" "Online Etymology Dictionary". ^ G. Johannes Botterweck; Helmer Ringgren, eds. (1979). Theological Dictionary of the Old Testament, Volume 3. Wm. B. Eerdmans Publishing. ISBN 978-0-8028-2327-4. ^ Norbert Samuelson (2006). Jewish Philosophy: An Historical Introduction. A&C Black. ISBN 978-0-8264-9244-9. ^ A Hebrew and English Lexicon of the Old Testament with an appendix containing the Biblical Aramaic, written by Francis Brown, Samuel Rolles Driver and Charles Augustus Briggs, based on the Hebrew lexicon of Wilhelm Gesenius as translated by Edward Robinson, Oxford: The Clarendon Press, 1906, s. 218. ^ Paul Joüon and T. Muraoka. A Grammar of Biblical Hebrew (Subsidia Biblica). Part One: Orthography and Phonetics. Rome : Editrice Pontificio Istituto Biblio, 1996. ISBN 978-8876535956. Quote from Section 16(f)(1)" "The Qre is יְהֹוָה the Lord, whilst the Ktiv is probably(1) יַהְוֶה (according to ancient witnesses)." "Note 1: In our translations, we have used Yahweh, a form widely accepted by scholars, instead of the traditional Jehovah"
^ F. M. Cross (1997). Canaanite Myth and Hebrew Epic. Harvard University Press. p. 61. ^ J.M. Lindenberger (2003). Ancient Aramaic and Hebrew Letters. Atlanta. pp. 110, 111. ^ G. Davis (2004). Ancient Hebrew inscriptions: corpus and concordance. Vol. 2. Cambridge. p. 18. ^ A. Vincent (1937). La religion des judéo-araméens d'Éléphantine (in French). Paris. ^ B. Porten (1968). Archives from Elephantine, The Life of an Ancient Jewish Military Colony. Berkeley – Los Angeles: University of California Press. pp. 105–106. ^ D.N. Freedman. YHWH. Theological Dictionary of the Old Testament. Vol 5. Eerdmans. p. 504. ISBN 0802823297. ^ R. Wilkinson (2015). Tetragrammaton: Western Christians and the Hebrew Name of God. From the Beginnings to the Seventeenth Century. Leiden: Brill. p. 65. ISBN 9004288171. ^ Frank Moore Cross (1997). Canaanite Myth and Hebrew Epic (reprint ed.). Harvard University Press. pp. 61–63. ISBN 0674091760. ^ H.O. Thompson (1992). D. N. Freedman, ed. Yahweh. The Anchor Bible Dictionary. Vol. 6. New York: Doubleday. p. 1011. ^ Lemaire, Andre (May–June 1994). ""House of David" Restored in Moabite Inscription" (PDF). Biblical Archaeology Review. Biblical Archaeology Society. 20 (03). Archived from the original (PDF) on 31 March 2012. ^ B. Alfrink, La prononciation 'Jehova' du tétragramme, O.T.S. V (1948) 43–62. ^ G. Bohak (2008). Ancient Jewish Magic. Cambridge: Oxford University Press. p. 306. ^ C. D. Ginsburg. The Massorah. Translated into English with a critical and exegetical commentary. IV. p. 28,§115. ^ Steven Ortlepp (2010). Pronunciation of the Tetragrammaton: A Historico-Linguistic Approach. p. 60. ISBN 978-1-4452-7220-7. ^ C. D. Ginsburg, Introduction to the Massoretico-Critical Edition of the Hebrew Bible, London 1897, s. 368, 369. These places are listed in: C.D. Ginsburg, The Massorah. Compiled from manuscripts, vol I, p. 26, § 116. ^ Since the BHS and BHK already have the Tetragrammaton in Psalm 68:26, this would make a total of 6,969 occurrences in the Masorah. ^ The Bible translator. vol. 56. United Bible Societies. 2005. p. 71. ; Nelson's expository dictionary of the Old Testament. Merrill Frederick Unger, William White. 1980. p. 229. ^ The Name of Jehovah in the Book of Esther., appendix 60, Companion Bible. ^ "Bible Gateway passage: תהילים 96:11 – The Westminster Leningrad Codex". ^ G.H. Parke-Taylor (2006). Yahweh: The Divine Name in the Bible. Waterloo, Ontario: Wilfrid Laurier University Press. ISBN 9780889206526. ^ A. Tronina, P. Walewski, Biblijne nazwy osobowe i topograficzne. Słownik etymologiczny, (Biblical personal names and topographical etymological dictionary) Częstochowa 2009, p. 109. ^ G. Buchanan, Studies in Hebrew proper names, London 1896, p. 163. ^ E. Jenni, C. Westermann, Theological Lexicon of the Old Testament, Hendrickson Publishers 1997, page 685. ^ "Genesis 2:4 in the Unicode/XML Leningrad Codex". Tanach.us. Retrieved 18 November 2011. ^ "Genesis 3:14 in the Unicode/XML Leningrad Codex". Tanach.us. Retrieved 18 November 2011. ^ "Judges 16:28 in the Unicode/XML Leningrad Codex". Tanach.us. Retrieved 18 November 2011. ^ "Genesis 15:2 in the Unicode/XML Leningrad Codex". Tanach.us. Retrieved 18 November 2011. ^ "1 Kings 2:26 in the Unicode/XML Leningrad Codex". Tanach.us. Retrieved 18 November 2011. ^ "Ezekiel 24:24 in the Unicode/XML Leningrad Codex". Tanach.us. Retrieved 18 November 2011. ^ Bezalel Porten, Archives from Elephantine: The life of an ancient Jewish military colony, 1968, University of California Press, pp. 105, 106. ^ Sufficient examination of the subject is available at Sean McDonough's YHWH at Patmos (1999), pp 116 to 122 and George van Kooten's The Revelation of the Name YHWH to Moses (2006), pp 114, 115, 126–136. It is worth mentioning a fundamental, though aged, source about the subject: Adolf Deissmann's Bible studies: Contributions chiefly from papyri and inscriptions to the history of the language, the literature, and the religion of Hellenistic Judaism and primitive Christianity (1909), at chapter "Greek transcriptions of the Tetragrammaton". ^ Translated by: P. Muchowski, Rękopisy znad Morza Martwego. Qumran – Wadi Murabba‘at – Masada, Kraków 1996, pp. 31. ^ E. Tov, Scribal practices and approache's reflected in the texts found in the Judean Desert, s. 206. ^ A complete list: A. Sanders, The Psalms Scroll of Qumran Cave 11 (11QPsa), serie Discoveries of the Judaean Desert of Jordan IV, pp. 9. ^ T. Muraoka. A Greek-Hebrew/Aramaic Two-way Index to the Septuagint. Peeters Publishers 2010. p. 72. ^ T. Muraoka. A Greek-Hebrew/Aramaic Two-way Index to the Septuagint. Peeters Publishers 2010. p. 56. ^ :E. Hatch, H.A. Redpath (1975). A Concordance to the Septuagint: And the Other Greek Versions of the Old Testament (Including the Apocryphal Books). I. pp. 630–648. ^ Sidney Jellicoe (1968). The Septuagint and Modern Study. Eisenbrauns. pp. 271–2. ISBN 0-931464-00-5. ^ Paul E. Kahle (1959). The Cairo Geniza. Oxford: Basil Blackwell. p. 222. ISBN 0758162456. ^ a b c Albert Pietersma (1984). KYRIOS OR TETRAGRAM: A RENEWED QUEST FOR THE ORIGINAL LXX (PDF). Mississauga: Benben Publications. pp. 91−92. ^ Geza Vermes (2011). The Complete Dead Sea Scrolls in English (7th Edition). Penguin, UK. ISBN 0141197323. ^ Larry W. Hurtado (2013). "The Divine Name and Greek Translation". ^ "Pavlos Vasileiadis | Doctor of Theology | Aristotle University of Thessaloniki, Thessaloníki | AUTH | Faculty of Theology". ResearchGate. ^ a b Pavlos D. Vasileiadis (2014). "Aspects of rendering the sacred Tetragrammaton in Greek" (PDF). Open Theology. 1: 56–88. ^ a b c d david. "THE SEPTUAGINT". ^ Mogens Müller (1996). The First Bible of the Church. The First Bible of the Church: A Plea for the Septuagint, Volume 1 of Copenhagen international seminar, Journal for the study of the Old Testament: Supplement series, Issue 206 of Supplement series. A&C Black. p. 118. ISBN 978-1-85075571-5. ^ Sean M. McDonough (1999). "2". The Use of the Name YHWH. YHWH at Patmos: Rev. 1:4 in Its Hellenistic and Early Jewish Setting, Wissenschaftliche Untersuchungen zum Neuen Testament. Mohr Siebeck. p. 60. ISBN 978-31-6147055-4. ^ Eugen J. Pentiuc (2014). Septuagint Manuscripts and Printed Editions. The Old Testament in Eastern Orthodox Tradition. Oxford University Press USA. p. 77. ISBN 978-0-19533123-3. ^ "Jewish Encyclopedia: GILYONIM". 1906. ^ Vasileiadis, Pavlos (2013). "The pronunciation of the sacred Tetragrammaton: An overview of a nomen revelatus [sic] that became a nomen absconditus [sic]" (PDF). Judaica Ukrainica. 2: 8. ^ a b c "F. Shaw, The Earliest Non-Mystical Jewish Use of Ιαω". www.jhsonline.org. ^ Didier Fontaine, "English Review of F. Shaw, The Earliest Non-Mystical Jewish Use of Ιαω (2014)"; also in French: "Review de F. Shaw, The Earliest Non-Mystical Jewish Use of Ιαω (2014)". ^ Robert A. Kraft. "Some Observations on Early Papyri and MSS for LXX/OG Study". ^ Z. Aly, L. Koenen, Three Rolls of the Early Septuagint: Genesis and Deuteronomy, Bonn 1980, s. 5, 6. ^ E. Tov, Scribal practices and approache's reflected in the texts found in the Judean Desert, pp. 231. ^ Robert J. Wilkinson (2015). Tetragrammaton: Western Christians and the Hebrew Name of God: From the Beginnings to the Seventeenth Century. BRILL. p. 141. ISBN 9004288171. ^ Sean M. McDonough (2011). YHWH at Patmos: Rev. 1:4 in Its Hellenistic and Early Jewish Setting. Wipf and Stock Publishers. p. 59. ISBN 1610971558. ^ Alan Mugridge (2016). Copying Early Christian Texts: A Study of Scribal Practice. Mohr Siebeck. p. 120. ISBN 9783161546884. ^ a b Gallagher, Edmon. ""The Religious Provenance of the Aquila Manuscripts from the Cairo Genizah," Journal of Jewish Studies 64 (2013)". Journal of Jewish Studies – via www.academia.edu. ^ B.D. Eerdmans, The Name Jahu, O.T.S. V (1948) 1–29. ^ Anthony John Maas. Jehovah (Yahweh) in The Catholic encyclopedia; an international work of reference on the constitution, doctrine, discipline, and history of the Catholic Church. Special edition, under the auspices of The Knights of Columbus Catholic Truth Committee. Edited by Charles G. Herbermann [and others] Published 1907 by The Encyclopedia Press in New York. ^ Irenaeus, "Against Heresies", II, xxxv, 3, in P. G., VII, col. 840. ^ Irenaeus, "Against Heresies", I, iv, 1, in P.G., VII, col. 481. ^ Clement, "Stromata", V, 6, in P.G., IX, col. 60. ^ Origen, "In Joh. ", II, 1, in P.G., XIV, col. 105, where a footnote says that the last part of the name of Jeremiah refers to what the Samaritans expressed as Ἰαβαί, Eusebius as Ἰευώ, Theodoretus as Ἀϊά and the ancient Greeks as Ἰαώ. ^ Eusebius, Praeparatio evangelica I, ix, in P.G., XXI, col. 72 A; and also ibid. X, ix, in P.G., XXI, col. 808 B. ^ cf. Lamy, "La science catholique", 1891, p. 196. ^ Jerome, "Ep. xxv ad Marcell. ", in P. L., XXII, col. 429. ^ Sebastian P. Brock The Bible in the Syriac Tradition St. Ephrem Ecumenical Research Institute, 1988. Quote Page 17: "The Peshitta Old Testament was translated directly from the original Hebrew text, and most Biblical scholars believe that the Peshitta New Testament directly from the original Greek. The so-called ""deuterocanonical" books, or "Apocrypha" were all translated from Greek, with ..."
^ Adam Kamesar. Jerome, Greek Scholarship, and the Hebrew Bible: A Study of the Quaestiones Hebraicae in Genesim. Clarendon Press, Oxford, 1993. ISBN 9780198147275. page 97. ^ "Names Of God". JewishEncyclopedia.com. Retrieved 18 November 2011. ^ Kristin De Troyer The Names of God, Their Pronunciation and Their Translation, – lectio difficilior 2/2005. ^ Miller, Patrick D (2000). The Religion of Ancient Israel. Westminster John Knox Press. ISBN 978-0664221454. ^ The Cambridge History of Judaism: The Late Roman-Rabbinic Period p 779 William David Davies, Louis Finkelstein, Steven T. Katz – 2006 "(BT Kidd 7ia) The historical picture described above is probably wrong because the Divine Names were a priestly ... Name was one of the climaxes of the Sacred Service: it was entrusted exclusively to the High Priest once a year on the "
^ "Judaism 101 on the Name of God". jewfaq.org. ^ For example, see Saul Weiss and Joseph Dov Soloveitchik (February 2005). Insights of Rabbi Joseph B. Soloveitchik. p. 9. ISBN 978-0-7425-4469-7. and Minna Rozen (1992). Jewish Identity and Society in the 17th century. p. 67. ISBN 978-3-16-145770-8. ^ M. Rösel The reading and translation of the divine name in the Masoretic tradition and the Greek Pentateuch – Journal for the Study of the Old Testament, 2007 "It is in this book that we find the strictest prohibition against pronouncing the name of the Lord. The Hebrew of 24.16, which may be translated as 'And he that blasphemes/curses (3B?) the name of the Lord (9H9J), he shall surely be put to death', in the LXX is subjected to a ..."
^ Kiddushin 71a states, "I am not referred to as [My name] is written. My name is written yod-hei-vav-hei and it is pronounced "Adonai." ^ a b Stanley S. Seidner,"HaShem: Uses through the Ages." Unpublished paper, Rabbinical Society Seminar, Los Angeles, CA,1987. ^ For example, two common prayer books are titled "Tehillat Hashem" and "Avodat Hashem." Or, a person may tell a friend, "Hashem helped me to perform a great mitzvah today." ^ See Deut. 12:2-4: "You must destroy all the sites at which the nations you are to dispossess worshiped their gods...tear down their altars...and cut down the images of their gods, obliterating their name from that site. Do not do the same thing to Hashem (YHWH) your God." ^ "Based on the Talmud (Shavuot 35a-b), Maimonides (Hilkhot Yesodei HaTorah, Chapter 6), and the Shulchan Arukh (Yoreh Deah 276:9) it is prohibited to erase or obliterate the seven Hebrew names for God found in the Torah (in addition to the above, there is E-l, E-loha, Tzeva-ot, Sha-dai,...). ^ "Judaism 101: The Name of G-d". 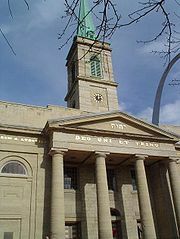 www.jewfaq.org. ^ Victor S. Appell, Why do some Jews write "G-d" instead of "God"? ^ The Talmud Yerushalmi and Graeco-Roman culture: Volume 3 – Page 152 Peter Schäfer, Catherine Hezser – 2002 " In fact, there is no proof in any other rabbinic writing that Samaritans used to pronounce the Divine Name when they took an oath. The only evidence for Sarmaritans uttering the Tetragrammaton at that ..."
^ A Catholic Handbook: Essentials for the 21st Century Page 51 William C. Graham – 2010 "Why Do We No Longer Say Yahweh? The Vatican's Congregation for Divine Worship and the Discipline of the Sacraments directed in ... just as the Hebrews and early Christians substituted other names for Yahweh when reading Scripture aloud." ^ "BibliaHebraica.org, "The Septuagint"". Archived from the original on 2010-05-04. ^ "HTC: An Orthodox Critique of Bible Translations". ^ "Search the Bible for Yahweh in BBE". ^ The Living Bible, "Jehovah" or "Lord" per text or footnotes. e.g. Genesis 7:16; 8:21; Exodus 3:15. ^ "BibleGateway – : Yahweh". ^ "Dixítque íterum Deus ad Móysen: «Hæc dices fíliis Israel: Iahveh (Qui est), Deus patrum vestrórum, Deus Abraham, Deus Isaac et Deus Iacob misit me ad vos; hoc nomen mihi est in ætérnum, et hoc memoriále meum in generatiónem et generatiónem." (Exodus 3:15). ^ "Dominus quasi vir pugnator; Iahveh nomen eius!" (Exodus 15:3). ^ "Aedificavitque Moyses altare et vocavit nomen eius Iahveh Nissi (Dominus vexillum meum)" (Exodus 17:15). ^ "Exodus 3:15: Dixítque íterum Deus ad Móysen: «Hæc dices fíliis Israel: Dominus, Deus patrum vestrórum, Deus Abraham, Deus Isaac et Deus Iacob misit me ad vos; hoc nomen mihi est in ætérnum, et hoc memoriále meum in generatiónem et generatiónem." ^ "Exodus 15:3: Dominus quasi vir pugnator; Dominus nomen eius!" ^ "Exodus 17:15: Aedificavitque Moyses altare et vocavit nomen eius Dominus Nissi (Dominus vexillum meum)"
^ "Letter of the Congregation for Divine Worship and the Discipline of the Sacraments (PDF)" (PDF). Retrieved 17 May 2016. ^ "United States Conference of Catholic Bishops Committee on Divine Worship (PDF)" (PDF). Retrieved 15 May 2014. This article incorporates text from a publication now in the public domain: Moore, George Foot (1911). "Jehovah" . In Chisholm, Hugh. Encyclopædia Britannica. Volume 15 (11th ed.). Cambridge University Press. pp. 311–314. 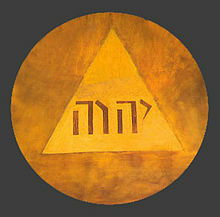 Wikimedia Commons has media related to Tetragrammaton.